I wish I had some adoption finalization news for you, but I don't. It is starting to wear on me. I can't stop thinking that it should be done already. So hopefully soon. I am going to have to make some adjustments to Jubilee's adoption party outfit because it was more geared for summer weather. On another note, I wanted to share something sweet and simple with you today because if I just dwell on our judge and how I'd like to slap a knot on his head then I spiral to a bad place. Over the weekend our family added a new furry family member to our crew. 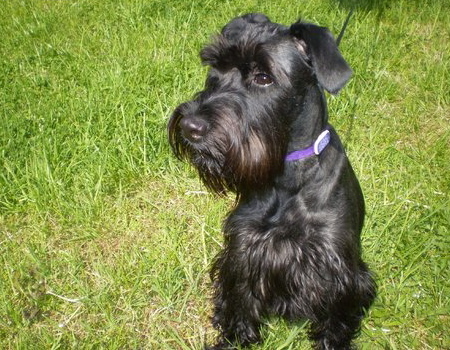 Her name is Marley and she is a standard schnauzer. She's so sweet, smart and good company. A great replacement, to fill our Buster's paw prints. She has been fitting right in and we grow more smitten with her each day. Before I get to the smile part let me give you a little background. Since the girls started pre-school we have had a time getting them to stop sticking their tongues out at each other and others. Yesterday morning as we were getting them dressed for school, Marley was nearby watching the process and panting quietly. Mercy in her best tattle tale voice said "Daaadddy Marwee is sticking her tongue out at Meeee." She then pointed her finger at her and told her that it was not nice. Eric and I just cracked up. So I hope my simple smile moment causes the curves of your lips to lift also.